Fellowship Hall: Following a detailed master plan, this first-phase fellowship hall stands on a 14-acre site in the growing university area. The plan arranges support spaces around a light-filled centrum, adding to the flexible nature of the space. 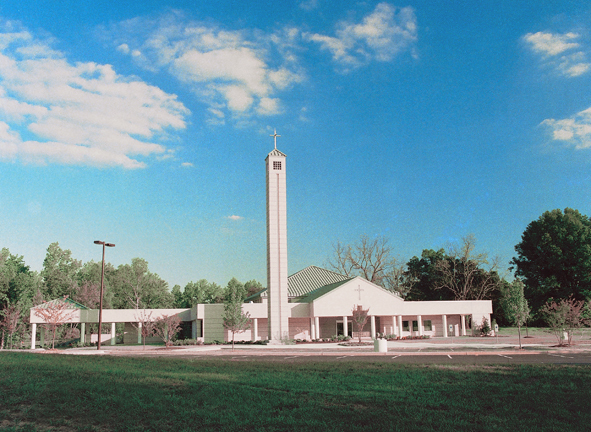 The use of white brick and an 80-foot bell tower gives the facility a unique identity, allowing it to attain landmark status. Worship Center: Work on this highly anticipated worship center began following extensive research by a sanctuary study committee. The resulting building contains a variety of spaces that can accommodate an even larger variety of functions. The lower level is 20,400 square feet of adult education, worship and the arts, and administration spaces. The main level is 23,900 square feet of gathering, meeting, and worship spaces. Included are a 100-seat chapel, a “hall of ministries,” and a flexible meeting/classroom area that doubles as a dressing room for the bride’s party. The worship space seats 600 on the main floor. A 5,700-square-foot balcony provides another 300 seats. With a large and open chancel/stage and integrated audio, video, and lighting systems, the worship center accommodates traditional and contemporary worship events, as well as a variety of appropriate performance types.